Marriott Vacations Worldwide Named One of Orlando's "Best Places to Work"
Marriott Vacations Worldwide was recently recognized as a finalist in the Orlando Business Journal's 2012 "Best Places to Work" awards as well as included in the publication's list of "Top 25 Largest Employers" in the July edition. The only vacation ownership company to make the publication's "Best Places to Work" list, Marriott Vacations Worldwide was one of 24 Orlando employers that drew rave reviews from its workers. "We are extremely proud to be named as one of Orlando's 'Best Places to Work,' which helps demonstrate our enduring commitment to creating an excellent workplace," said Stephen P. Weisz, president and chief executive officer of Marriott Vacations Worldwide. "One of our core values is putting people first – so having our own associates provide feedback for this award is a testament of our great culture and unique programs that appreciate and help open doors to a world of opportunities," said Weisz. This year's competition received 88 nominations which were then narrowed to a list of 24 finalists based on how workers responded to an anonymous online employee engagement survey. The 37 questions focused on topics including trust, feeling valued and recognition. The finalists were divided into five divisions, based on number of employees, with Marriott Vacations Worldwide being recognized as one of three companies to have the highest employee satisfactions scores in the "mega" division. The publication highlighted the company's unique employee benefits including Marriott room rate discounts, Club 25 and Associate Appreciation Week to honor its associates. Above photo is Marriott's Harbour Lake in Orlando, where timeshare rentals start at just $86/night. 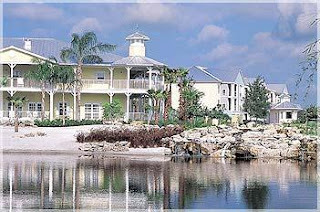 View other Marriott Orlando timeshare rentals.